"It's another tequila sunrise..." in Puerto Vallarta, Mexico! (Ok, I won’t in Vallarta by the time you read this, but don’t get wrapped up in the details). I’m sipping this awesome Don Julio Reposado but decided to break lose from the party and write this up. Why is that, you ask? 'Cause I'm weird, we’re in early AM hours, and the sun’s about to rise… the perfect time to share the tequila sunrise recipe. The Eagles sang about it back in 1973. The legend lives to this day. It's the best known tequila cocktail(along with margaritas). 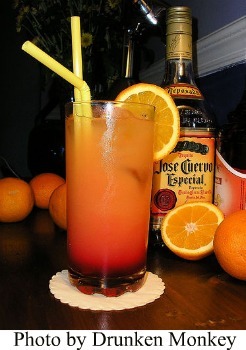 Its famous “sunrise” effect comes from the grenadine sinking and floating through the tequila and orange juice. It gives the drink very warm feeling. The Eagles knew what they were doing when they sung about this legendary mix. It’s cool, tasty, simple, and visually perfect: an all-in-one that’ll fit any situation. Ice goes first. Fill half the glass, follow it up with your tequila, and finish up with the orange juice. You should have a full glass. Now tilt your glass, flip your grenadine bottle, and serve on the drnk. The grenadine should touch bottom and slowly rise (hello sunrise!). Add the orange garnish to the Collins glass and you're done. Practice does make perfect. However, NEVER STIR THE DRINK! That’s the noobiest mistake in the book. No, let it sink and rise on its own the way pros do it, OK? Good. Optional: make it 2 parts tequila for an extra agave punch. The Eagles tried it and so should you. This grenadine, orange, and tequila mix should satisfy even the most demanding aficionados. Try it, master it, and then brag about it with guys and gals. Aight everyone, that’s a wrap. Over and out!